Green Roof Design and Installation Wednesday, February 28th 2018 Green Roof Design and Installation provides the latest information on green roof benefits, technical standards, product innovations, and design and installation best practices. It presents tools and techniques needed to meet green roof project objectives on schedule, to specification, and within budget. Green Roof Waterproofing and Drainage Thursday, March 1st 2018 This course will provide participants with an overview of waterproofing and drainage construction and maintenance for green roof assemblies. 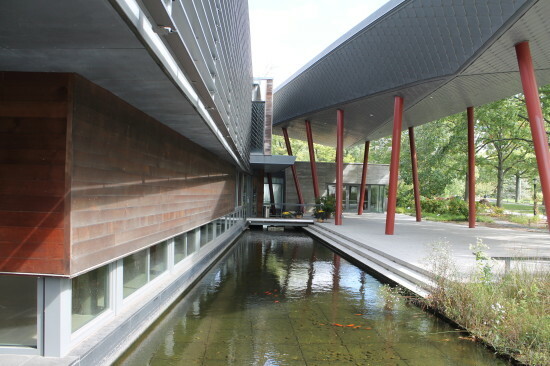 It lays out technical vocabulary and materials and presents detailed design solutions and implementation best management practices for waterproofing and drainage in green roofs. Green Roof Plants and Growing Media Friday, March 2nd 2018 This course will provide participants with an overview of plants and growing media design considerations and maintenance for green roof assemblies. It establishes design and implementation best management practices for plants and growing media in green roofs. Tuition: Green Roof Design and Installation - $499 before January 28th, $524 starting January 29th. Green Roof Waterproofing and Drainage - $399 before January 28th, $424 starting January 29th. Green Roof Plants and Growing Media - $399 before January 28th, $424 starting January 29th. GRHC members receive an additional $25 discount on each course. If paying by check, please note it must be received in our office no later than one week before the event. Registrations may be canceled by a participant up to THREE DAYS prior to the event, and will incur a $50 cancellation fee per course. We regret that we cannot cancel a registration after that point. 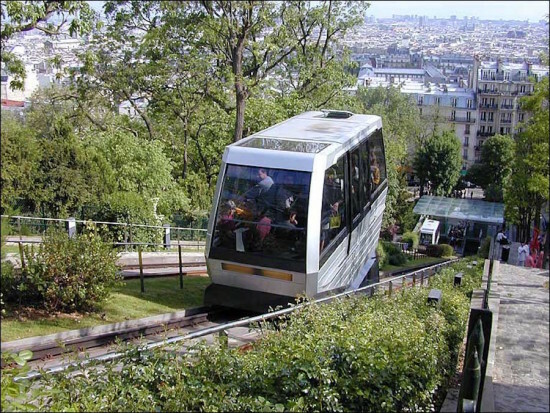 Continuing Education Credits: Green Roofs for Healthy Cities is an approved continuing education provider with USGBC/GBCI, AIA CES, LA CES, APLD, BOMI and RCI. Earn up to 7.5 Continuing Education (Professional Development) Hours per course. Water has been called the oil of the 21st century. Whether too much (Exhibit A: Hurricane Sandy) or too little (Exhibit B: California, Texas, and the Southwest), conserving, cleaning, and controlling it has never been a higher priority for architects and their clients. From rooftops to underground, these innovative systems and products work to make the most of every drop. Eco-Optiloc Unilock The L-shape format of this permeable paver ensures a superior lock-up that can withstand the pressure of the heaviest commercial loads. Small voids between units provide drainage into a sub-base. Custom colors available. StormTank Brentwood Industries An economic alternative to crushed stone or pipe chamber systems, this flexible system can be deployed for infiltration, detention, reuse, and pretreatment purposes. Cudo Water Storage System Oldcastle Stormwater Solutions Boasting 95 percent capacity, these snap-together components can be assembled to accommodate various configurations of pipelines and flow channels. Grasscrete, Molded-Pulp Former Bowmanite For constructing on-grade areas of pervious surfaces, these single-use forms are made of 100 percent recycled paper and are biodegradable. GeoPave Presto Geosystems A herringbone grid of recycled, high-density polyethylene cells with mesh bottoms provides stability for aggregate surfaces while acting as a natural, on-site stormwater management system. 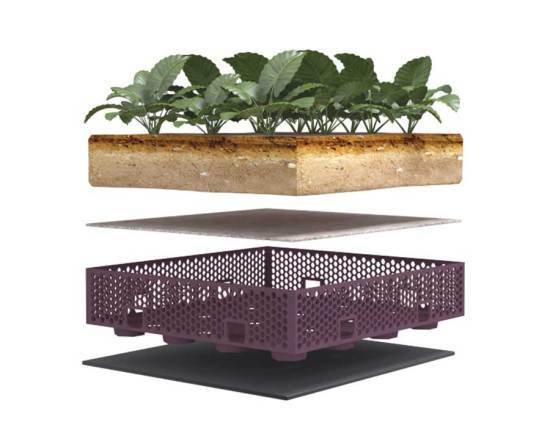 SkyScape Vegetated Roof System Firestone Building Products This pre-grown vegetated roof system integrates filter fabric, drainage panels, and geotextile into a single, labor-saving roll. Sedum mats use regional-specific cultivars. Rainwater Hog HOG Works Slim and modular, these rainwater collection tanks can be installed vertically or horizontally. Fabricated of food-grade polyethylene, the 50-gallon containers are UV-stabilized and impervious to light. Rainstore3 Invisible Structures A modular, stackable structure used to store stormwater underground, it exceeds H-20 loading standards, allowing construction of driving areas and parking lots above the system. 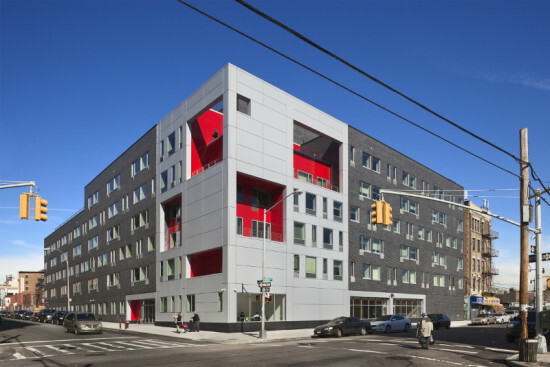 An aluminum rain screen and locally-sourced brick articulate a two-part program. 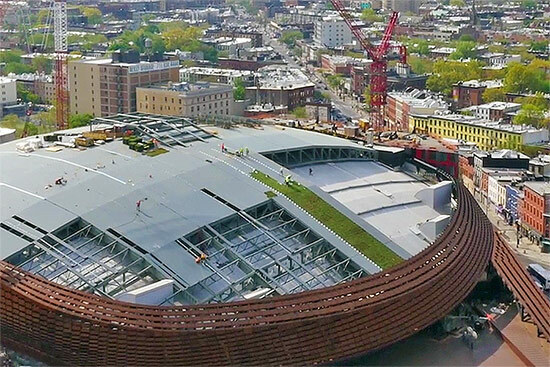 Over one-hundred-thousand-square-feet of sedum will be implanted into the Barclays Center’s massive, logo-emblazoned, bald-spot of a roof. According to the Wall Street Journal, SHoP is designing the green topper for the one billion dollar arena. Plans for a public green space on top of the arena date back over a decade, but were later scrapped due to cost constraints. But, now, Atlantic Yards developer Forest City Ratner has revived the plan—sort of. 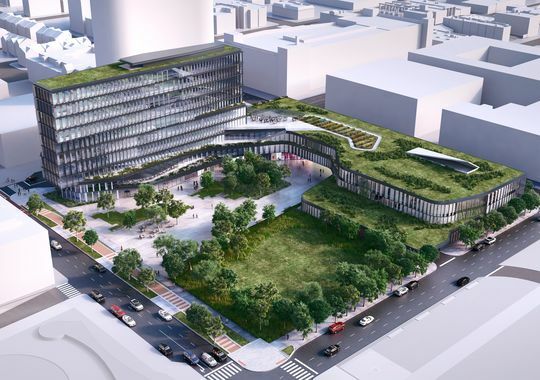 The green roof won’t so much be a public space, as it will be a marketing tool. Ratner representatives told the Journal that the new roof will help entice prospective tenants into the apartments rising around the center. Turns out, a green roof provides a better view than a Barclays logo. 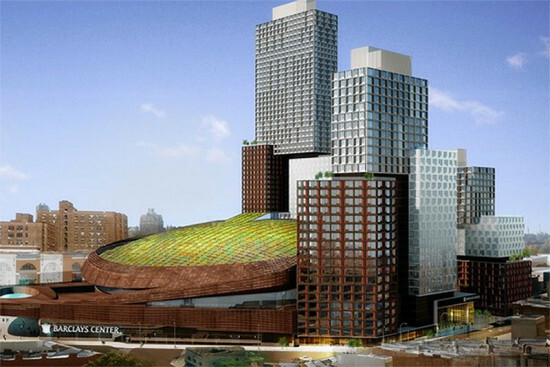 They also claim that the green roof will cut down on noise from concerts, which have been much louder than the developer expected.